Professional built filter box that easily filters ponds up to 2,500 gallons and can handle flow rates up to 5,000 gallons per hour. 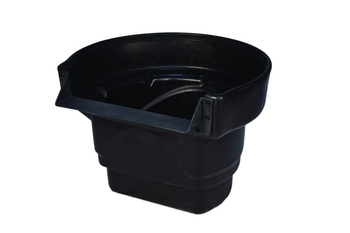 Durable rotational-molded polyethylene ensures maxium strength and withstands whatever Mother Nature can dish out. All Aquascape BioFalls Filters include a lifetime warranty! * Reversible waterfall lip option, which provides the flexibility of using a natural stone spillway and large accent boulders along the front of the unit. * Removable upper tray can hold rocks, plants, and gravel, helping to naturalize the BioFalls Filter into the surrounding landscape. * Corrosion resistant non-cross-threading hardware stands up to the elements. * Two Poly-Flo ESA biological Filter Mats provide 50% more surface area than traditional filter mats. 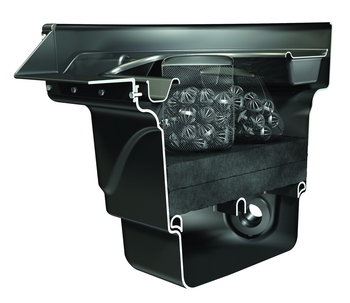 * Two bulkhead ports provide plumbing options. * Filter support rack ensures evenly distributed waterflow though the filter mats and provides structural strength to the walls of the filter. * Circular shape provides maxium strength and makes it easy to camouflage into the landscape. Bulkhead Port: ................ Dual 2"